Holding time is an impossible task. 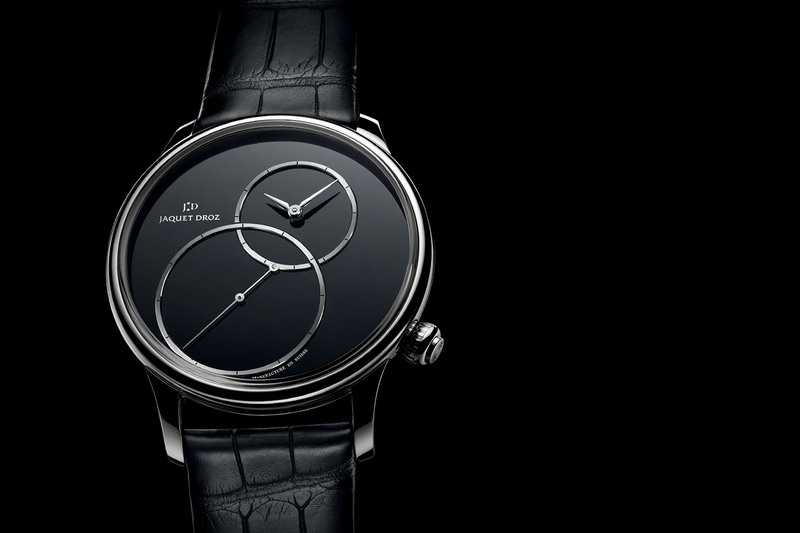 Jaquet Droz has come close with the Grande Seconde SW, which contains, encases and locks down, if not time itself, then the presentation of time. 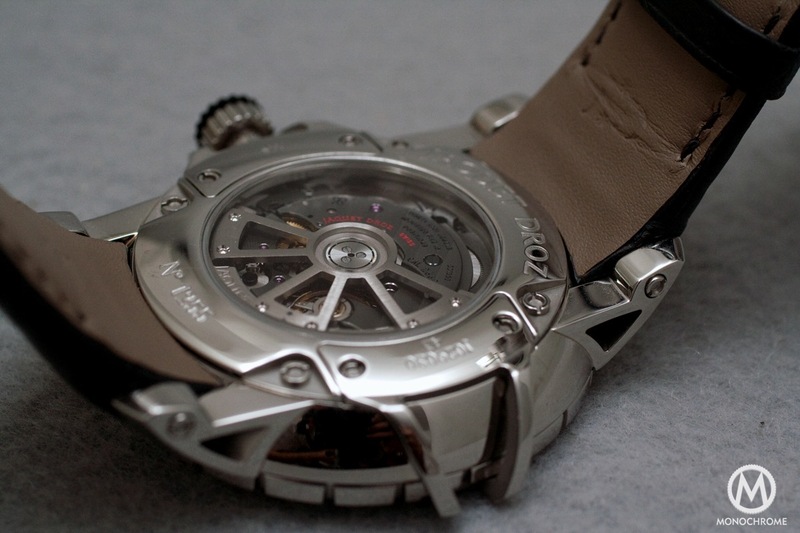 The bowl case, reminiscent of ancient Rome’s tripods, has hollow, triangular leg lugs, and the case is enveloped by a case-guard with two hooks from the caseback (one of them doubles as a crown guard). The “secured” aesthetic is further reinforced with a clever buckle guard that snaps shut, keeping the buckle behind bars. The visual impression, reinforced by sharp angles and industrial lines, is that this watch is buttoned down on the wrist like a vault. 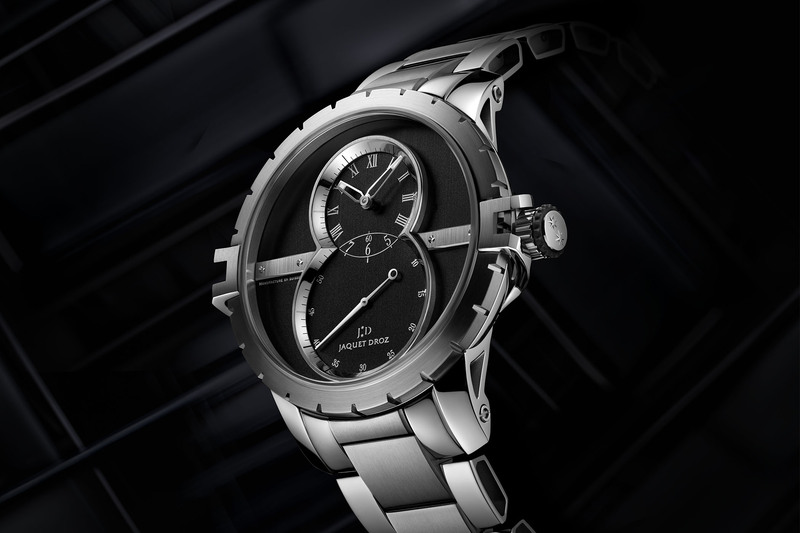 The Jaquet Droz Grande Seconde SW’s toughness allows the classification of a Sports Watch, but the overall design discloses a more nuanced understanding – typical Jaquet Droz. Instead of fire like the tripods of old, this futuristic container holds time. 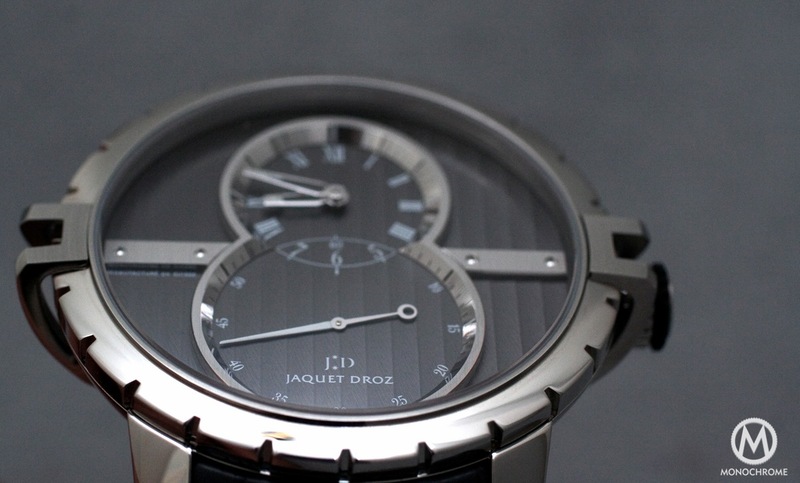 Jaquet Droz has made a watch that interacts with its environment, specifically light. Most black dials absorb light, end of story, but this dial’s Geneva stripes create a louver effect, which returns light differently depending on the angle and creates the illusion of opening and closing the blinds. In addition, the high level of metal polish contrasted with brushed pieces accentuates the interplay of light. Light gives the watch many different personalities. 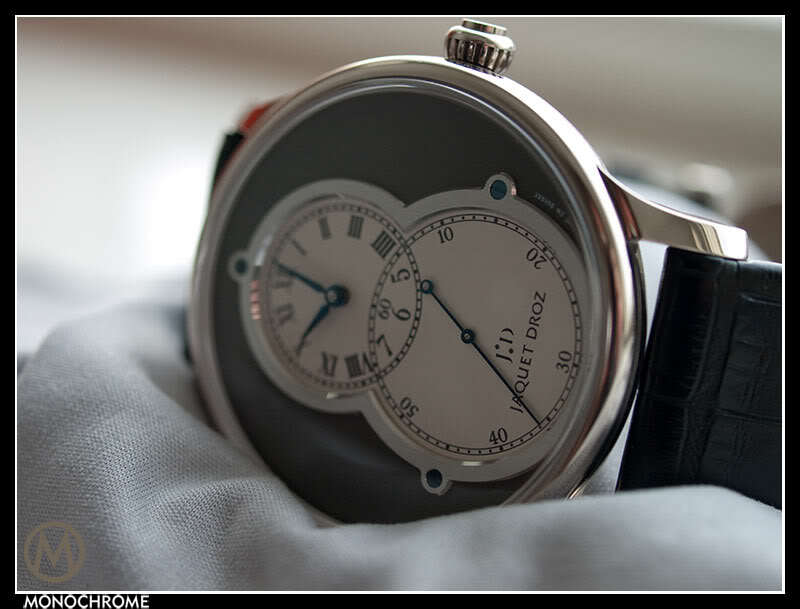 The Jaquet Droz Grande Seconde SW industrial first impression leads to the notion of the watch being fastened. 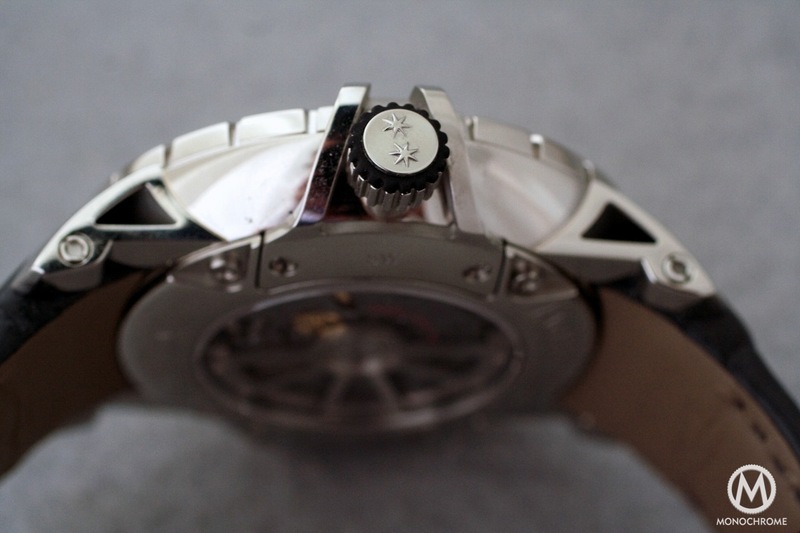 There are plenty of visible screws (four on the front bridge, eight on the caseback, and one on each lug’s side), and even the screw heads undergo reinterpretation as rivets. 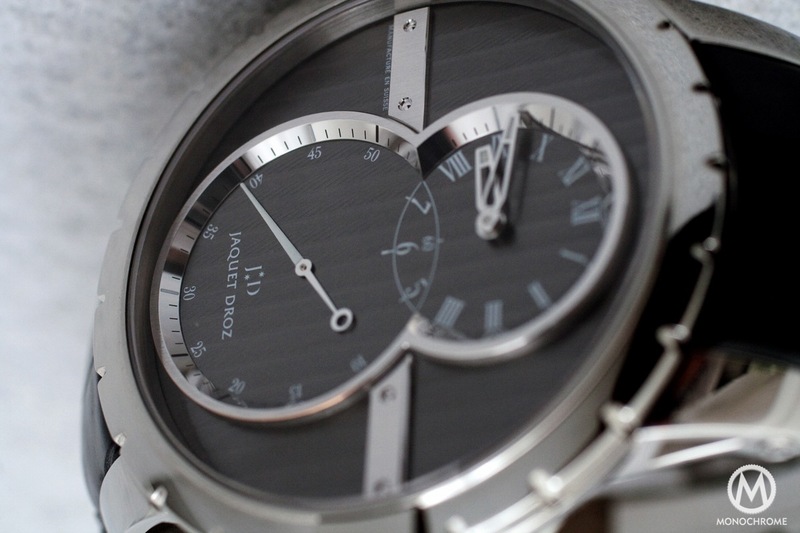 The notched bezel could double as a gear wheel, and the overall gray/silver/black color scheme furthers the machine theme. 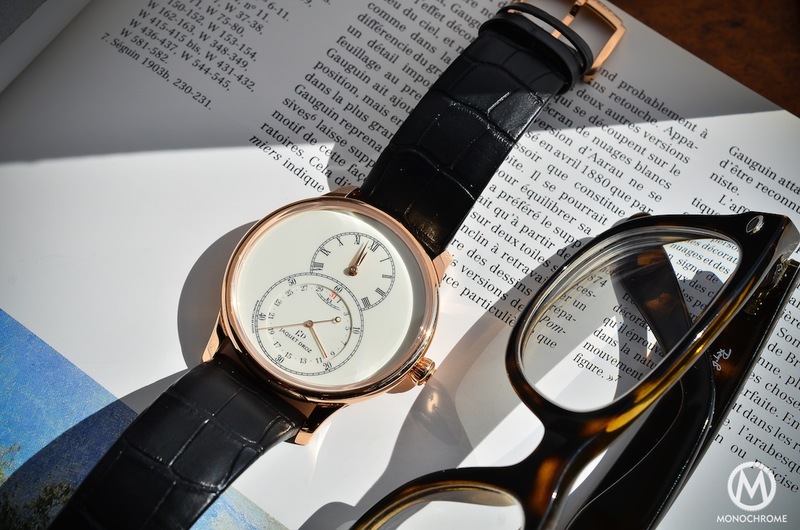 The prominent Grande Seconde figure eight is the SW’s unmistakable identifier, a design favored by Jaquet Droz on his pocket watches. 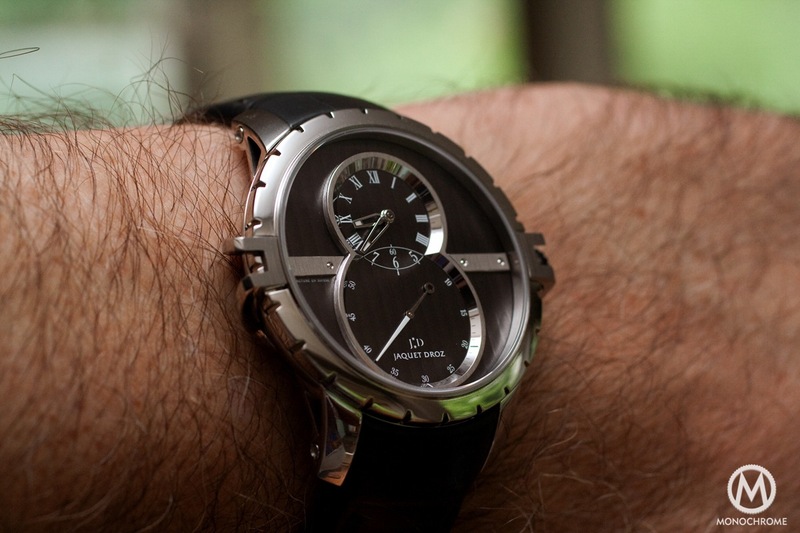 We previously reviewed the Grande Seconde, and a comparison with the Jaquet Droz Grande Seconde SW (Sports Watch) model will reveal the Grande Seconde’s figure eight DNA. If you would like more background on the company, you can find it here. The main feature of this watch is the oversized seconds sub-dial in the lower figure eight from which comes the name Grande Seconde. Large seconds were useful in nautical navigation and distinguish themselves from the small seconds ordinarily used in pocket watches. There are no additional complications, like a date complication, which gives the dial a clean symmetry and the pocket watch reminiscence from which this watch is born. The industrial theme carries onto the dial with 18-carat white gold raised sub-dial rings and applied horizontal plates. We mentioned the louver effect of the vertical Côtes de Genève pattern across the anthracite gray dial, which coupled with the white gold and polished metal make light a living characteristic of the watch. 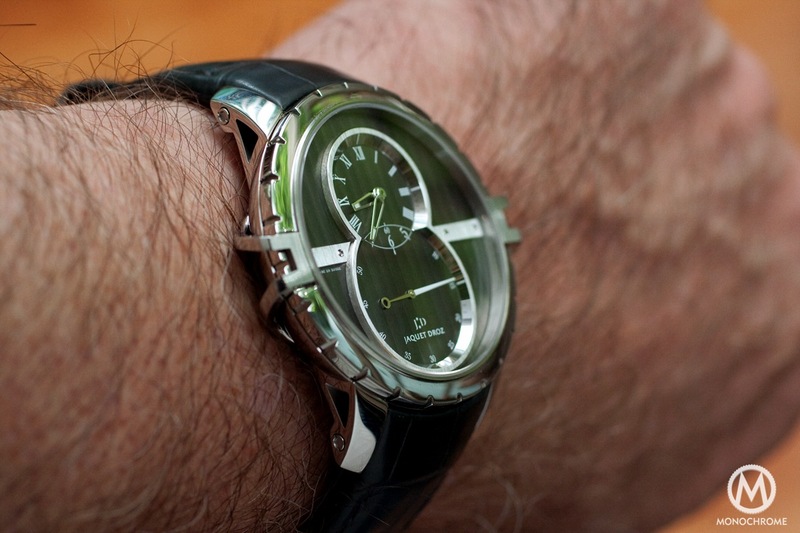 A vertical straight-on view of the watch shows that the tops of the case-guard, dial plates and figure eight sub-dials are brushed in contrast to otherwise polished surfaces. 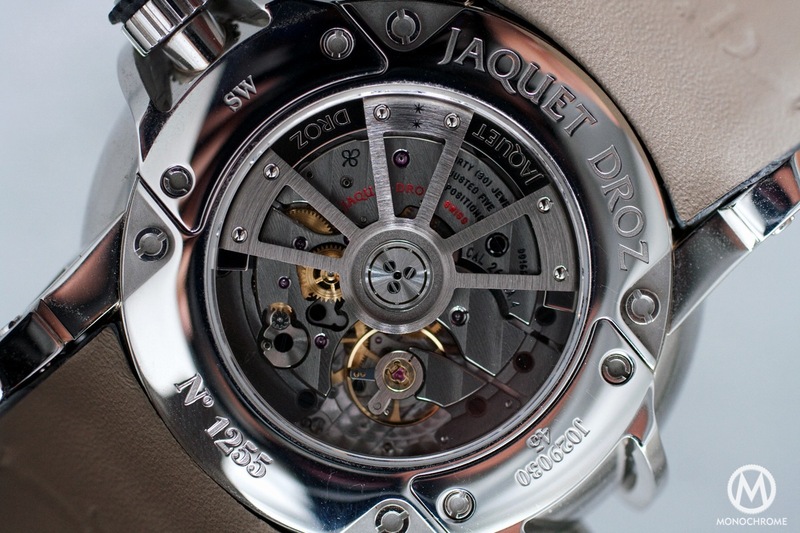 Looking at the dial with varying light conditions and angles-of-view reveals this watch’s changing personality. For all the tough exterior, the sub-dials’ interior tells a customary Grande Seconde story. The two-tone (rhodium treated/SuperLuminNova) large second hand with a generous counterbalance embodies the gracefulness of traditional watch making. All the hands have BGW9 SuperLumiNova tips, and the index figures are luminous. 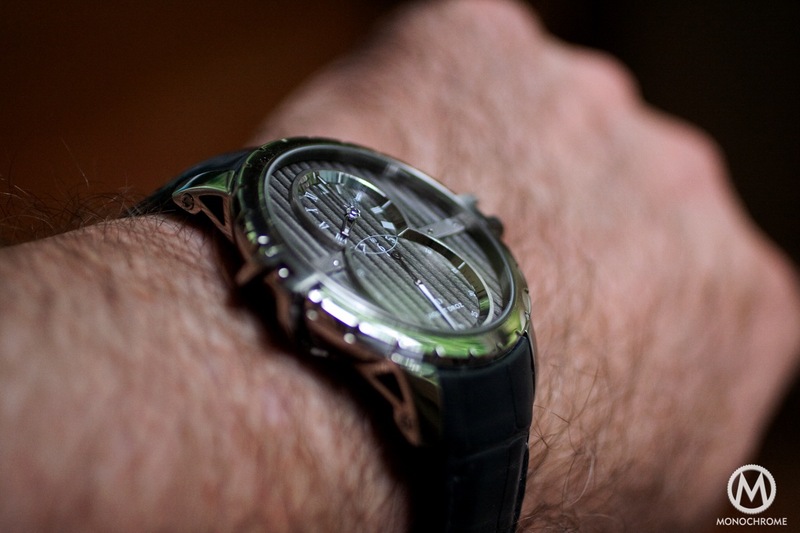 The smaller upper hands are skeletonized and rotate around Roman numerals, whereas the second hand marches around Arabic numerals – for the most part that is. Upon on inspection, you will notice that the sub-dials are slightly off-center. 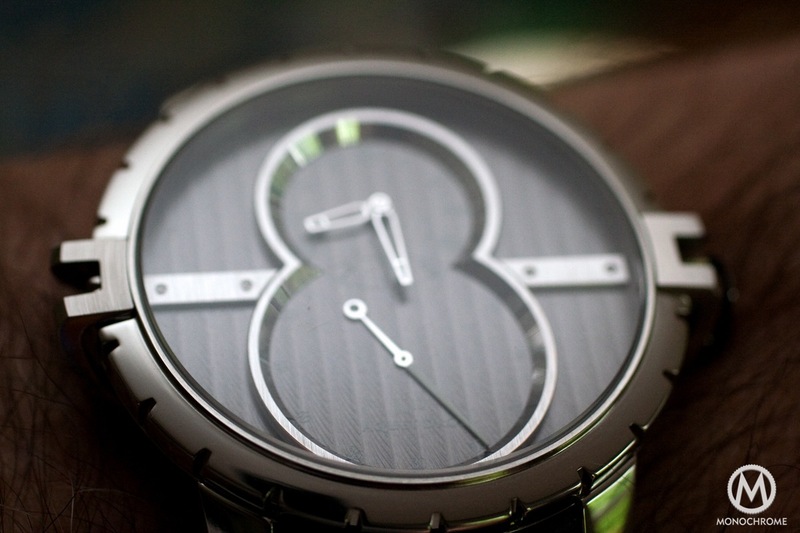 Extending the lines graphically of the raised figure eight outline creates a Venn diagram on the dial face where the Arabic numerals prevail. The applied plates across the dial face also protrude from this intersection of circles. 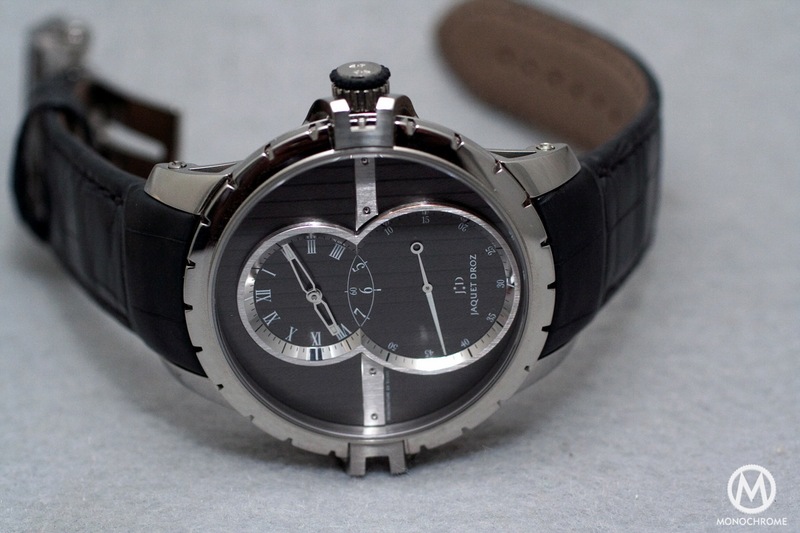 The hand-made alligator strap matches the dial’s anthracite gray color and has tone on tone side stitching. Because the case lugs’ extension is so pronounced, the strap’s connection point is farther down than you would expect. The result is a perfect fit within the lugs and against the case. The buckle deserves special attention. It has a cage design corresponding to the secured theme of the case. To size the strap and adjust the pin, one must unlock the cage. The bar opens on the side opposite of the case crown and takes some force to open. We delighted in this secret intricacy, which is likely to puzzle the uninitiated. 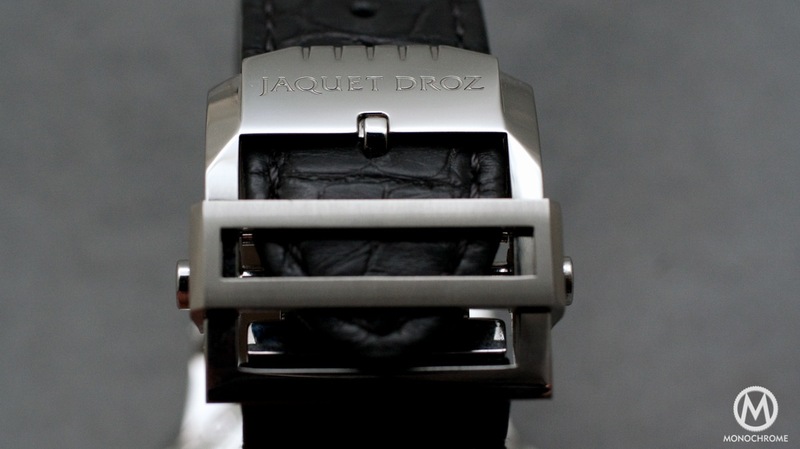 The stainless steel deployant clasp is opened by two side buttons and folds closed with a click. 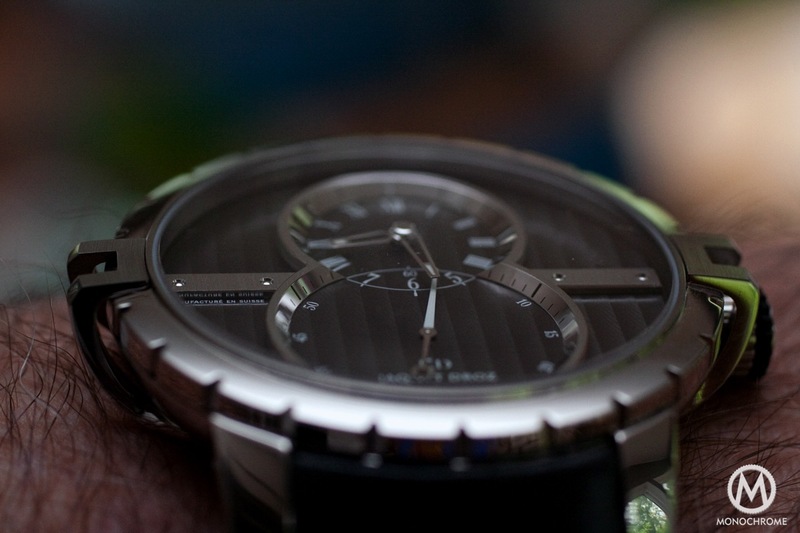 The 45mm bowl case has a notched bezel and despite its SW designation has only 50 meters of water resistance. 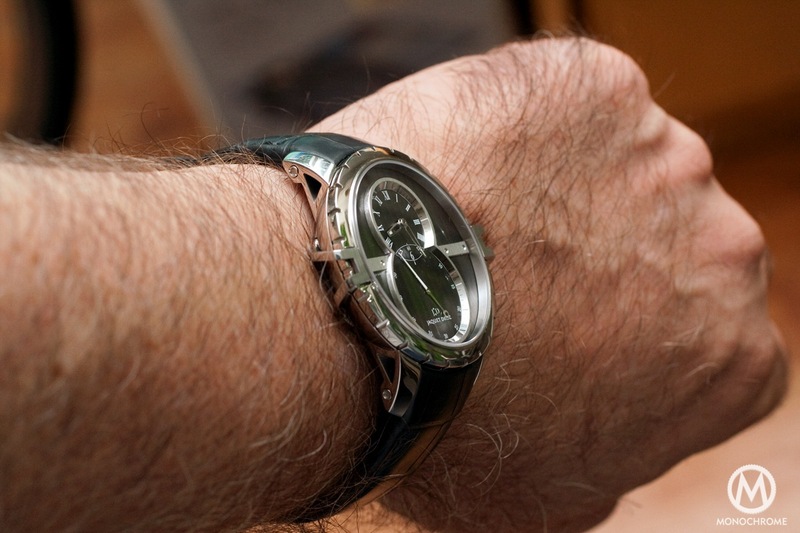 The watch appears to sit on your wrist because its lugs look like legs extending from the bowl case. The right case hook doubles as a crown guard for the stainless steel, rubber-tipped crown. The crown’s rubber is more of a visual enhancement because its width is too thin for assisting grip. 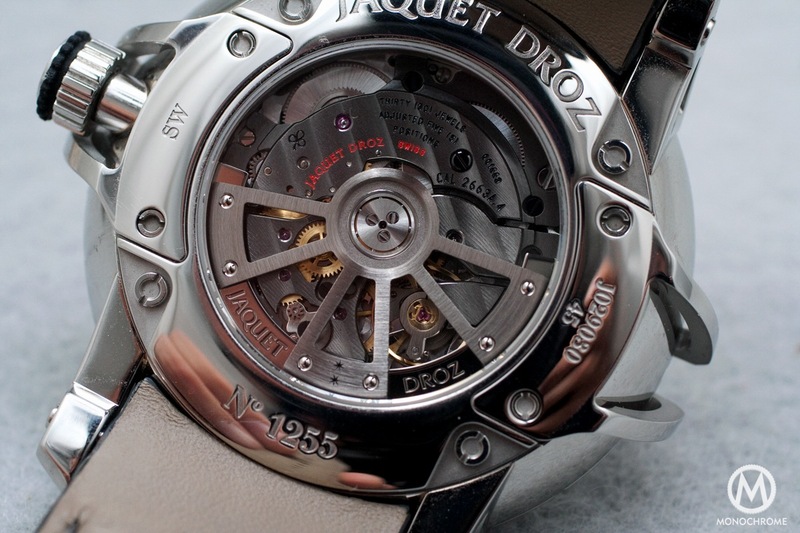 An additional visual motif is the two stars on the end of the crown, a Jaquet Droz signature also visible in the company logo. Trace a figure eight around the stars, and you have the pattern on the dial. 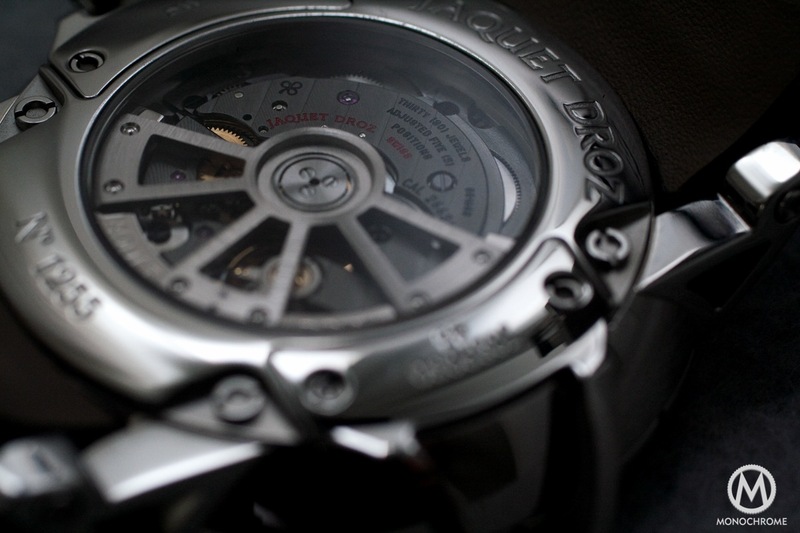 The see-through caseback reveals a beautifully decorated movement underneath an 18-carat white gold turbine rotor. The darker, rutherium-treated bridges (Ru is a metal of the platinum family) have a diagonal Côtes de Genève pattern. 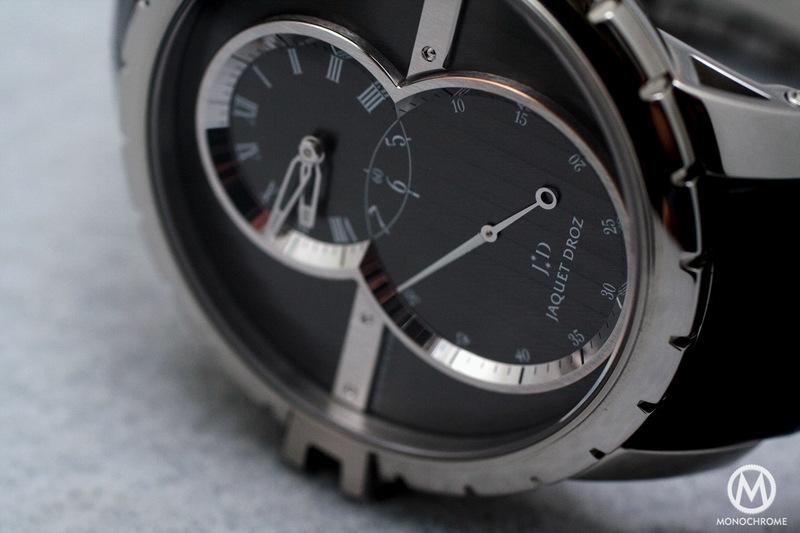 Notice the engraved shamrock, a Jaquet Droz signature motif on their watch movements. Double barrels provide 68 hours of power reserve, which is transmitted through the going train gears to the escapement, beating at 4 Hz. The movement calibre 2663A-S has 30 jewels and comes courtesy of the Swatch Group’s Manufacture Blancpain. 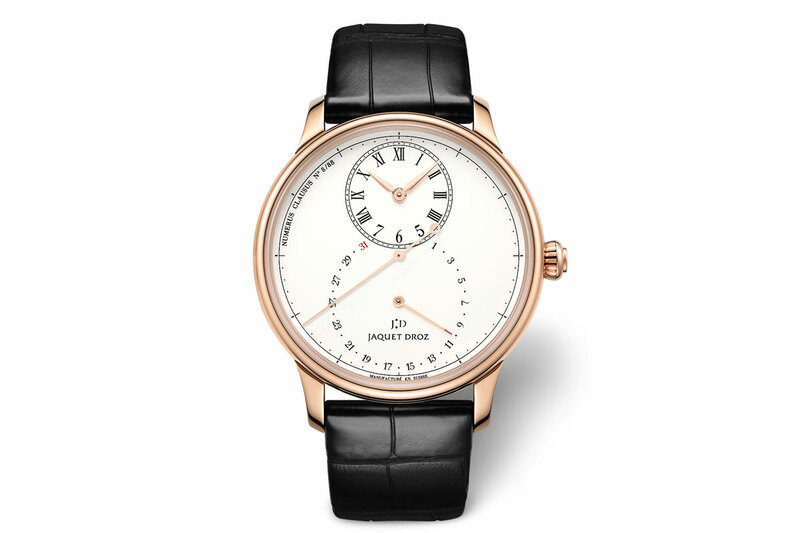 The SW (Sports Watch) designation is more an identifier within the Grande Seconde family than a tool for sports enthusiasts, meaning the Grande Seconde SW is Jaquet Droz’s elucidation of a sportier Grande Seconde. The watch is less formal and more masculine, giving the Grande Seconde an industrial makeover of hard lines and sharp edges. It works with a range of vestments; it’s right at home with jeans and a T-shirt, but will also dress up. 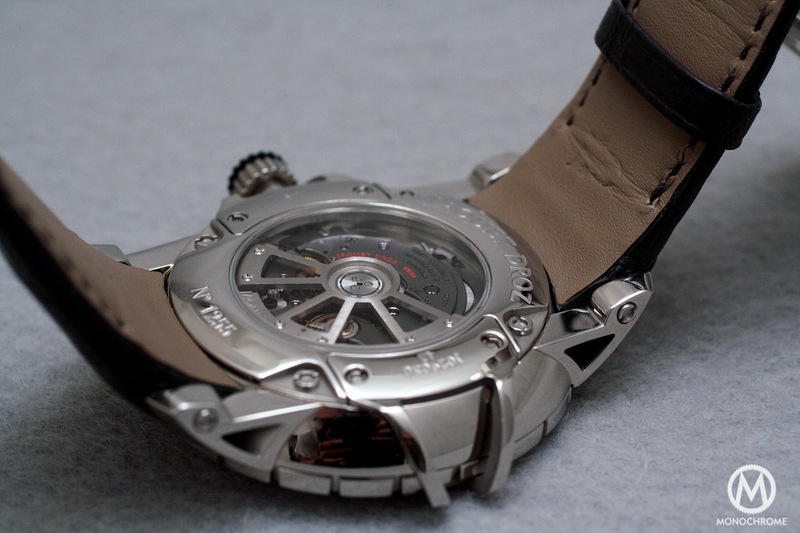 In addition, the case has its own faux clasp of two side hooks, which secures the watch. 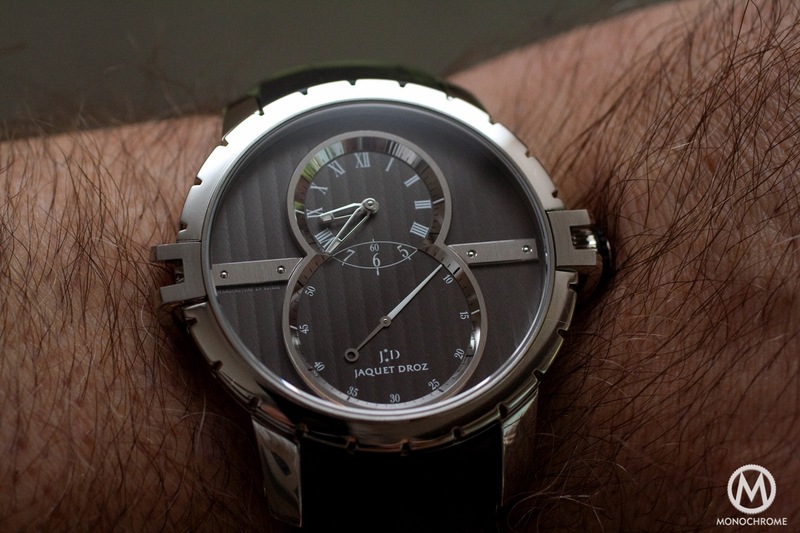 For the metaphorically inclined, the Jaquet Droz Grande Seconde SW has captured time. Strong design interpretation of the Grande Seconde – a very, very strong conceptual design. The rubber tip on the crown looks great, but for grip, we would have coated the entire edge in rubber.